On the night of March 27, 1971, the oil tanker SS Texaco Oklahoma was ploughing its way through heavy seas about 120 miles northeast of Cape Hatteras. Laden with 33,000 tons of crude oil bound from Port Arthur to Boston, the tanker was suddenly rent in two. The bow rolled over but stayed afloat while the stern section drifted for 32 hours. The thirteen crew members sleeping in the bow of the ship were never found, however, the remaining crew were able to abandon the stern section in a lifeboat. Unfortunately, only thirteen survivors were picked up. The wreck resulted in extensive changes to American maritime safety regulations, including the decommissioning of 200+ WWII-era vessels. 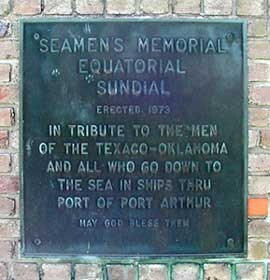 Five years later a memorial was erected to the fallen in Port Arthur and an annual memorial service continues to be held for all seaman lost at sea. I’m a former member of NMU and Ernie Polite was a dear friend and shipmate that will always be remembered. May God Bless you my friend.